Just unpack the device and start using it: This approach typically works when you buy something like a television, radio, or mixer – but not a Raspberry Pi. 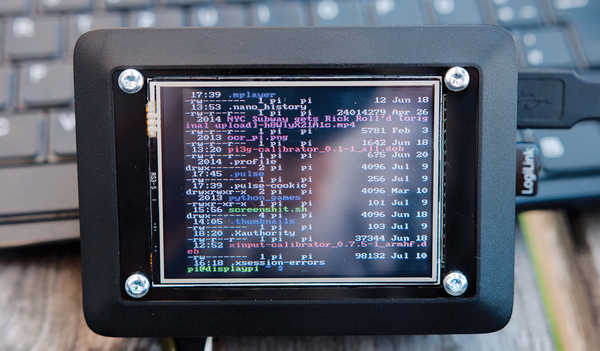 Usually, the Pi user has to purchase a power supply and cover, assemble everything, prepare a memory card with an operating system, make sure you have a TV or monitor with an HDMI connection, and then make sure a keyboard is connected. The Display T. Box  from pi3g might not be as easy to use as a mixer, but the added convenience of an integrated touchscreen allows the user to implement many ideas much more easily. The set comes almost entirely pre-assembled. All you need to do is plug in the WiFi adapter and connect the power supply. The manufacturer has located the microSD memory card behind a small, removable hatch in the cover. To get the card out, you need to remove the four screws holding the display screen in place and take the display cover out of the housing. The housing is good to have for projects carried out in public areas. Hobbyists can do without the housing if they want to be able to change the memory card without using a screwdriver. 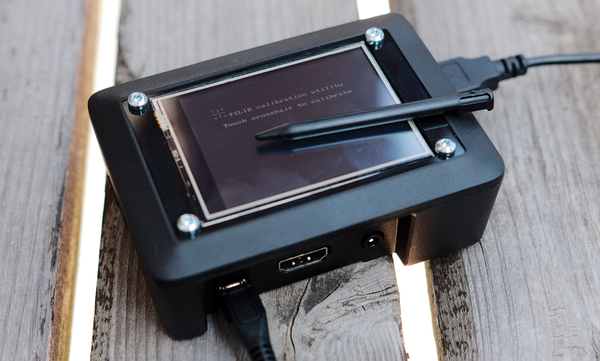 Once it has been hooked up to a power source, the Display T. Box boots directly into a virtual terminal within a few seconds, just as if the device were connected to a standard monitor or a TV. Because of its limited resolution, however, the terminal only offers 40 columns by 30 lines. Thus, output almost always contains line breaks (Figure 1). Figure 1: The lines in the Display T. Box terminal are only 40 characters long. The display screen has been mounted so that all cables stick out of the bottom of the housing. This is a bit impractical because the Display T. Box cannot be set on the table like a monitor. It can sit securely on a desk if it is placed upside down; however, in this position, everything on the display screen is upside down. Future versions of the firmware are supposed to include a capability for rotating the display via configuration parameters. Raspbian can recognize the USB WiFi adapter that pi3g provides. The box will find your WiFi network once you specify the access data for the system. You need to connect a USB keyboard to the box and then use Nano to edit the wpa_supplicant.conf file found in /etc/wpa_supplicant. This involves adding the network name and accompanying passwords for one or more WiFi networks (Listing 1). To save the changes, press Ctrl+O, and confirm the file name by pressing Enter. The key combination Ctrl+X closes the editor and takes you back to the terminal. As a rule, a connection is established between the box and the WiFi network if these instructions are followed. If you are using a special type of WiFi encryption or if you still use WEP, you will need to adapt the entries accordingly. Information on how this is done is available online . The final step in establishing the connection is to reboot the network service. Then, you can use ping to test whether you have Internet access (Listing 2). The ping may go off into empty space if you have forgotten to do something like plug in the USB stick before booting. If a problem with access occurs, restart the Raspberry Pi one time via sudo reboot. PING raspi-geek.de (195.122.146.144) 56(84) bytes of data. (Figure 2). The included stylus is for tapping as precisely as possible on the displayed crosshairs overlaid on the screen. The virtual terminal is calibrated after you go through the process for the first time. The second round calibrates the input with an X server running. The tool closes once you are finished. Figure 2: Because the touchscreen has a resistive surface, you first need to calibrate it to ensure precise input. The Display T. Box touchscreen comprises of two flexible sheets. Placing pressure on them with a stylus or a finger causes contact between the two. Perhaps you remember these types of screens from first-generation PDAs and smartphones. One disadvantage of this technology is its lack of precision. This approach also makes it difficult to drag objects reliably across the display without dropping them by mistake. The display also registers input with the stylus of your choice.